Green Solvents app: now with mini-game! Ever had an idle moment where you just want to entertain yourself with a mindlessly simple game, but still want to stay in the chemistry zone and keep focused on staring at molecules? 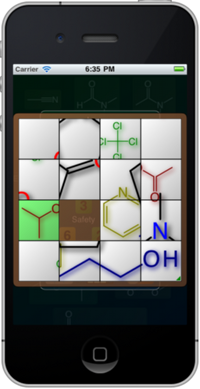 Well very soon you will be able to: the version of Green Solvents that has just been submitted to the App Store has a built-in mini-game! The game is based on the a classic pocket-sized game which involves dividing a picture into a grid of tiles, and removing one of them. Any tile may be moved into the missing position if it is adjacent, and so by shuffling through enough permutations, eventually the full picture can be restored. An exciting YouTube clip of gameplay is available, and with any luck, it will be downloadable in a few days. Green Solvents is free, so if you don’t already have it, check it out.